The U.S. military may have an Iron Man suit prototype ready by summer and will hold a competition to encourage civilian craftsmen to develop suit components. While he may not be Tony Stark, U.S. Navy Admiral William McRaven said that the first prototypes of an Iron Man-like combat suit could be ready for testing this summer. Speaking at the 25th annual Special Operations and Low-Intensity Conflict conference on Tuesday, McRaven said that three unpowered prototypes are being assembled and expected to be delivered in June. The head of U.S. Special Operations Command, McRaven believes that the suit "will yield a revolutionary improvement in survivability and capability for special operators." Some 56 corporations, 16 government agencies, 13 universities and 10 national laboratories are working on the program, and the command seeks to solicit further aid by holding a "Monster Garage" event. Pending the Pentagon's go-ahead, the event will even reward expert mechanics and master craftsman who develop suit components with prize money. 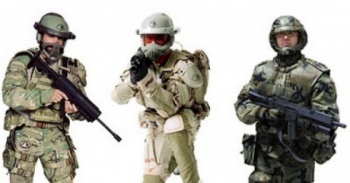 The suit, known as the Tactical Assault Light Operator Suit - or TALOS - will eventually provide its wearer with advanced armor, superior mobility and agility, enhanced situational awareness, built-in communications and computers, a personalized HUD, cooling or heating as needed, and even medical monitoring and basic first-aid care. TALOS has the potential to provide the U.S. with a "huge comparative advantage over our enemies and give our warriors the protection they need," McRaven said.